Shop With Pockets Visa Card On Any Website Or Mobile App & Get 10% Cashback!! This Cashback Is Over And Above The Discount Offered By The Merchant. 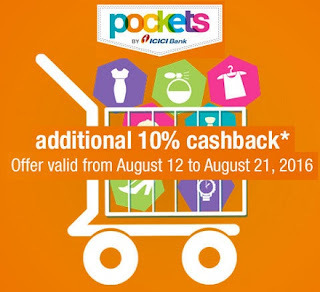 -> This Offer Valid From August 12(7 p.m.) to August 21,2016. Read And Follow Below Mention Steps To Grab Pockets Visa Card Offers. • Now pay the Amount to Get 10% Cashback!! - The offer is not available for payments to other wallets,Bill payment and mobile recharges. - The offer is not applicable on existing ecommerce offers on Pockets. No two offers on Pockets can be clubbed together.